I took my 2001 Honda Accord EX 4cyl sedan out for an alignment today after having 4 new tires put on. I knew my front toe was way out because both front tires were almost down to the steel belt on the inside shoulder. No fancy suspension, plain old stock parts. Do these numbers look right or should I go back for a second opinion? Also, the alignment template shows it is for a Honda Civic, same year but not for an Accord? Does it matter or is it the numbers that count? 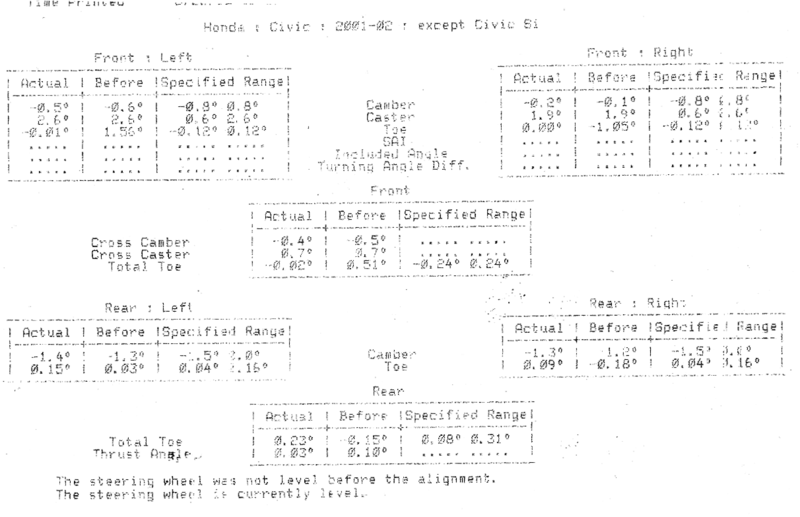 on top pf this sheet said honda civic 2001-02, but you said you have a accord , if this is the case the alignment on your car is not even close to be right .every year model have different specs ,specs can be modified on the alignment computer ,we (i'm a tech i do this for leaving )modified specs for track (race) cars , looks like they select the wrong one by accident .and it looks like the L/R TOE can be adjust a bit better ,the camber is not factory adjustable on any wheel ,(camber is whit in spec ) but if your vehicle had kit's they can get better numbers then that . Help, I give up. I surrender. 98 Accord major hesitation issue. Detailed Explanation.